Connections are made using GPIO ("General Purpose Input/Output") pins. Unlike USB, etc., these interfaces are not "plug and play" and require care to avoid miswiring. The Raspberry PI GPIOs use 3.3V logic levels, and can be damaged if connected directly to 5V levels (as found in many older digital systems) without level-conversion circuitry. Note that no analogue input or output is available. 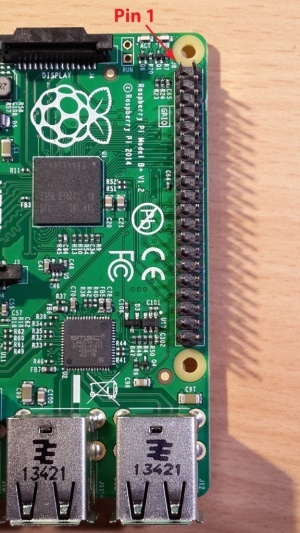 However, add-on boards such as the Rpi Gertboard provide this capability. For further specific information about the Raspberry Pi's BCM2835 GPIOs, see: RPi BCM2835 GPIOs. To connect devices to the serial port (UART), see the RPi Serial Connection page. Sample circuits for interfacing the GPIOs with other electronics are shown on the RPi GPIO Interface Circuits page. Revision 1 PCBs also do not have the P5 header (see below). See this discussion for more details of the changes between Rev 1 and Rev 2 PCBs. The P2 header is the VideoCore JTAG and used only during the production of the board. It cannot be used as the ARM JTAG . This connector is unpopulated in Rev 2.0 boards. The P3 header, unpopulated, is the LAN9512 JTAG . The P5 header was added with the release of the Revision 2.0 PCB design. Note that the connector is intended to be mounted on the bottom of the PCB, so that for those who put the connector on the top side, the pin numbers are mirrored. 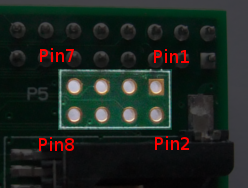 Pin 1 and pin 2 are swapped, pin 3 and 4, etc. An alternative way to attach this header is on top, at a slant away from the P1 header. Note that the connector is placed JUST off-grid with respect to the P1 connector. The P6 header was added with the release of the Revision 2.0 PCB design. A reset button can be attached to the P6 header. Momentarily shorting the two pins of P6 together will cause a soft reset of the CPU (which can also 'wake' the Pi from halt/shutdown state). The Raspberry Pi Model A+ and B+ boards, and the Pi 2 Model B, have a 40-pin header marked J8, arranged as 2x20 pins. The first 26 pins are the same as P1 on the A/B boards, with the remaining 14 pins providing additional GPIO and ground pins, and an EEPROM ID feature for auto-configuration with add-on "HAT" boards. GPIO voltage levels are 3.3 V and are not 5 V tolerant. There is no over-voltage protection on the board - the intention is that people interested in serious interfacing will use an external board with buffers, level conversion and analog I/O rather than soldering directly onto the main board. 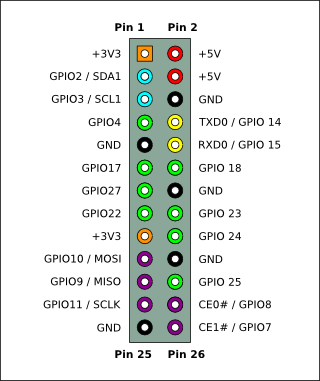 All the GPIO pins can be reconfigured to provide alternate functions, SPI, PWM, I²C and so. 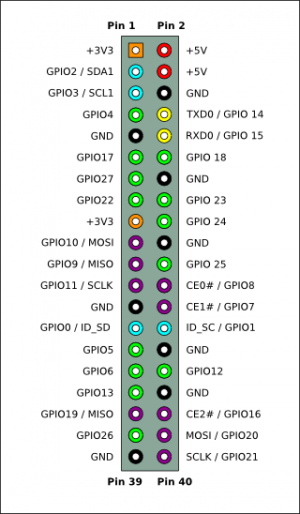 At reset only pins GPIO 14 & 15 are assigned to the alternate function UART, these two can be switched back to GPIO to provide a total of 17 GPIO pins. Each of their functions and full details of how to access are detailed in the chipset datasheet . Each GPIO can interrupt, high/low/rise/fall/change. There is currently no support for GPIO interrupts in the official kernel, however a patch exists, requiring compilation of modified source tree. The 'Raspbian "wheezy"'  version that is currently recommended for starters already includes GPIO interrupts. GPIO input hysteresis (Schmitt trigger) can be on or off, output slew rate can be fast or limited, and source and sink current is configurable from 2 mA up to 16 mA. Note that chipset GPIO pins 0-27 are in the same block and these properties are set per block, not per pin. 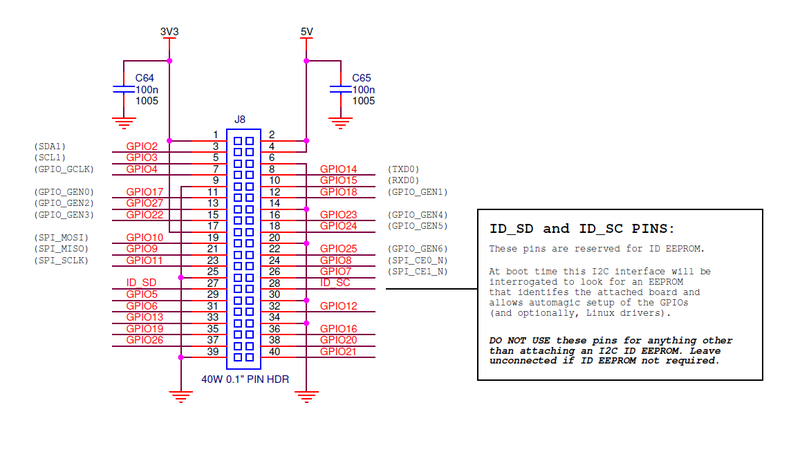 See GPIO Datasheet Addendum - GPIO Pads Control. Particular attention should be applied to the note regarding SSO (Simultaneous Switching Outputs): to avoid interference, driving currents should be kept as low as possible. The available alternative functions and their corresponding pins are detailed below. These numbers are in reference to the chipset documentation and may not match the numbers exposed in Linux. Only fully usable functions are detailed, for some alternative functions not all the necessary pins are available for the funtionality to be actually used. There is also some information on the Tutorial on Easy GPIO Hardware & Software. Kernel boot messages go to the UART at 115200 bit/s - there are more details on the serial port page. Pin 3 (SDA0) and Pin 5 (SCL0) are preset to be used as an I²C interface. So there are 1.8 kohm pulls up resistors on the board for these pins. It is also possible to reconfigure GPIO connector pins P1-7, 15, 16, 18, 22 (chipset GPIOs 4 and 22 to 25) to provide an ARM JTAG interface. However ARM_TMS is not available on the GPIO connector (chipset pin 12 or 27 is needed). Chipset pin 27 is available on S5, the CSI camera interface however. A second I²C interface (GPIO02_ALT0 is SDA1 and GPIO03_ALT0 is SCL1) and two further GPIOs (GPIO05_ALT0 is GPCLK1, and GPIO27) are available on S5, the CSI camera interface. The expansion header is referred to as "Expansion Header" or "GPIO Connector (P1)"
Pins on the GPIO connector (P1) are referred to as P1-01, etc. Names GPIO0, GPIO1, GPIOx-ALTy, etc. refer to the signal names on the SoC as enumerated in the Broadcom datasheet, where "x" matches BCM2835 number (without leading zero) and "y" is the alternate number column 0 to 5 on page 102-103 of the Broadcom document. For example, depending on what you are describing, use either "GPIO7" to refer to a row of the table, and "GPIO7-ALT0" would refer to a specific cell of the table. When refering to signal names, the Broadcom name should be modified slightly to minimize confusion. The Broadcom SPI bus pin names are fine, such as "SPI0_*" and "SPI1_*", but they did not do the same on the I²C and UART pins. Instead of using "SDA0" and "SCL0", "I2C0_SDA" and "I2C0_SCL" should be used; and "UART0_TXD" and "UART0_RXD" instead of "TX" or "TXD" and "RX" or "RXD". The maximum permitted current draw from the 3.3 V pins is 50 mA. Maximum permitted current draw from the 5 V pin is the USB input current (usually 1 A) minus any current draw from the rest of the board. Be very careful with the 5 V pins P1-02 and P1-04, because if you short 5 V to any other P1 pin you may permanently damage your RasPi. Before probing P1, it is a good idea to strip short pieces of insulation off a wire and push them over the 5 V pins are not accidentally shorted with a probe. As noted above, P1-03 and P1-05 (SDA0 and SCL0 / SDA1 and SCL1) have 1.8 kohm pull-up resistors to 3.3 V.
GPIO02, 03, 05 and 27 are available on S5 (the CSI interface) when a camera peripheral is not connected to that socket, and are configured by default to provide the functions SDA1, SCL1, CAM_CLK and CAM_GPIO respectively. SDA1 and SCL1 have 1K6 pull-up resistors to 3.3 V.
GPIO06 is LAN_RUN and is available on pad 12 of the footprint for IC3 on the Model A. On Model B, it is in use for the Ethernet function. GPIO28-31 are used by the board ID and are connected to resistors R3 to R10 (only on Rev1.0 boards). GPIO40 and 45 are used by analogue audio and support PWM. They connect to the analogue audio circuitry via R21 and R27 respectively. GPIO46 is HDMI hotplug detect (goes to pin 6 of IC1). GPIO47 to 53 are used by the SD card interface. In particular, GPIO47 is SD card detect (this would seem to be a good candidate for re-use). GPIO47 is connected to the SD card interface card detect switch; GPIO48 to 53 are connected to the SD card interface via resistors R45 to R50. The community implemented SPI and I²C drivers , which will be integrated with the new Linux pinctrl concept in a later version of the kernel. (On Oct. 14 2012, it was already included in the latest raspbian image.) A first compiled version as Linux modules is available to install on the 19/04/2012 Debian image, including 1-wire support. The I²C and SPI driver uses the hardware modules of the microcontroller and interrupts for low CPU usage, the 1-wire support uses bitbanging on the GPIO ports, which results in higher CPU usage. GordonH wrote a (mostly) Arduino compatible/style WiringPi library in C for controlling the GPIO pins. 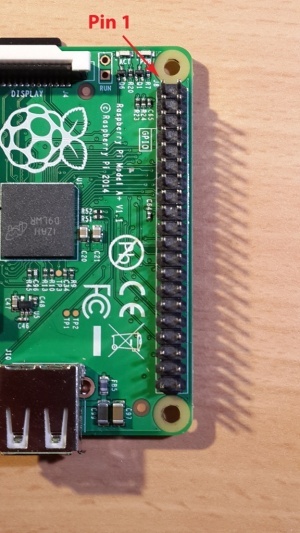 There are two I²C-buses on the Raspberry Pi: One on P1, and one on P5. On the production board, the Raspberry Pi Foundation design brings out the MIPI CSI-2 (Camera Serial Interface) to a 15-way flat flex connector S5, between the Ethernet and HDMI connectors. A compatible camera with 5 Megapixels and 1080p video resolution was released in May 2013. On the production board, the Raspberry Pi Foundation design brings out the DSI (Display Serial Interface) to a 15-way flat flex connector labelled S2, next to Raspberry Pi logo. It has two data lanes and a clock lane, to drive a possible future LCD screen device. Some smart phone screens use DSI. HDMI-CEC (Consumer Electronics Control for HDMI) is supported by hardware but some driver work will be needed and currently isn't exposed into Linux userland. Eben notes that he has seen CEC demos on the Broadcom SoC they are using. libCEC with Raspberry Pi support has been included in OpenELEC and will be included in Raspbmc RC4. For more information about HDMI-CEC and what you could do with it on the Raspberry Pi please see the CEC (Consumer Electronics Control) over HDMI article. ↑ Forum:Sad about removal of I2S. Why was this change made? This page was last edited on 19 January 2017, at 08:15.